Happy New Year to everyone in the wide world! l.a.Eyeworks has its sights on 2009 with some fresh windows to encourage everyone to "stirrup some cheer" as we celebrate, among other things, a "moo world order"! Cheers! The big November feast is nearly upon us, and that means it's pie time! l.a.Eyeworks' Thanksgiving windows put a spin on an infamous phrase from this year's historic presidential campaign. Only this time, we decided to drill for pie! Pictured here in the Melrose Avenue store, and as you can see, our gigantic gourds continue to stay put as they sit out the rest of November. For more photos from the Melrose Avenue, Beverly Boulevard, and South Coast Plaza retail stores, check out their photo albums to the left. The gourds are back, and this year they've got a mighty message to spread! Always culturally proactive, l.a.Eyeworks is doing its part to make sure people hustle their way to the polls on November 4th for the upcoming election. With a riff off the classic "every vote counts" slogan, the pumpkins demonstrate that the numbers add up, and that everyone's vote matters It is also an annual l.a.Eyeworks tradition to give a home, or window, to several giant gourds in need. This year, both the Melrose and South Coast Plaza stores adopted a few twisted pumpkins. The Beverly store (pictured above) has the fortunate opportunity to house our very own homegrown pumpkins which were raised on fertile l.a.Eyeworks soil. Here at l.a.Eyeworks, we like to keep it clear, uncensored and simple, so get out there and vote! 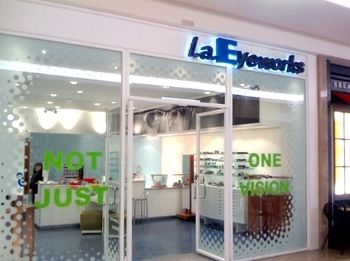 You can also check out other l.a.Eyeworks windows in the each of the stores' photo galleries. Make sure to check out the new windows at the Melrose and Beverly stores! The current windows read, "Not Just One Vision"! If you think that you're having a flash-back, fear not! The same phrase was recently installed at the South Coast Plaza store a week prior, and you can read up on the fabulous window-inspiring interview by Barbara Kruger! Last week, the new window at the South Coast Plaza store was installed, and it looks YUMMY! In lime green lettering, the phrase "Not Just One Vision" creates an umbrella that covers an abundance of ideas and meanings. 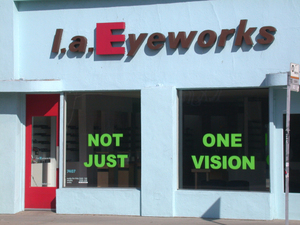 For this edition of the l.a.Eyeworks windows, inspiration was directly pulled from an interview that the LA Times conducted with artist, and l.a.Eyeworks friend, Barbara Kruger. Promoting the new public art project entitled "Women in the City", Barbara comments about the evolving role of women in the art world. To paraphrase her, there is not just one vision. To check out the full article, read the actual quote (hint: it's towards the end), and learn about the other participating artists, click here.